This post is brought to you by Marriott Rewards Credit Card from Chase. The content and opinions expressed below are that of Alex in Wanderland. I, I reluctantly admit, am not special. Science says so. Anyway, back to how not special I am. It might seem like becoming a divemaster, frolicking with elephants, and attending international music festivals are exciting and special things. But no, I’ve learned. Those are just things millennials like. One brand wanted to know more — so they asked a bunch more people. Marriott Rewards Credit Card recently conducted a nationwide survey of travelers (defined by those who stay in a hotel at least five nights per year) aged 18-67 to see if they could once and for all suss out what us millennials (ages 18-34) are really into. Based on their findings, shown above, I’m a pretty standard millennial. That divemaster training I loved so much? 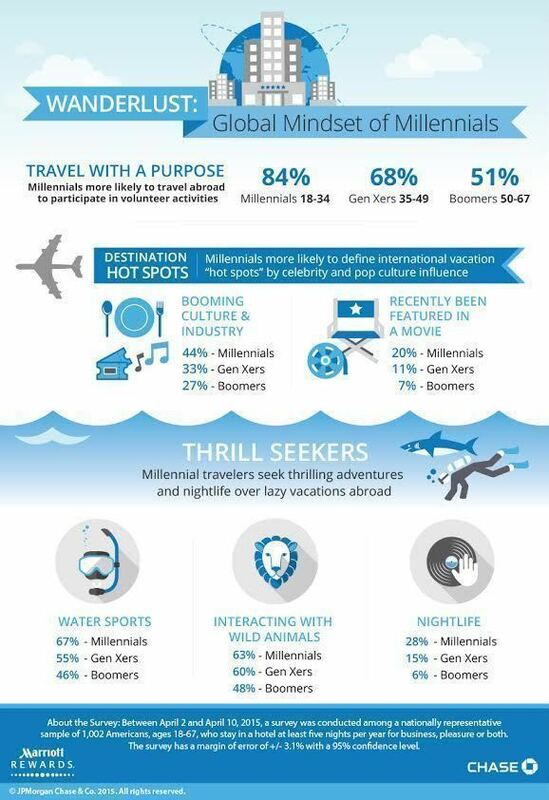 A full 67% of millennials interested in so-called “thrilling vacations” are into watersports too. That elephant I fed bananas to? Yup, 63% of millennials are armed with a fruit basket and up for hanging out with wild animals. And Tomorrowland, the electronic playground I attended in Belgium last summer? Well, 28% of millennials seek out nightlife when they travel, almost double the number of Gen Xers (15%) ages 35 – 49, and more than quadruple the number of Boomers (6%), ages 50-67, who do the same. To me, all these findings speak to an idea that I believe to my core — in general, my generation doesn’t want to simply take vacations, or fly to another country just to plop on the beach and relax. There’s sleeping-when-we’re-dead for that! No, we don’t want to take vacations — we want to have adventures. You guys know I’m a travel hacking addict — and one of the keys to getting started is finding the best way to manage your money abroad with the perfect travel credit card for you. One example? The Marriott Rewards Credit Card from Chase, which has no foreign transaction fees, and allows travelers to rack up accelerated Marriott Rewards points on all purchases. I have personally used cards like this to help me earn points that I redeem for nice hotels when I need a break from backpacking — it’s an awesome treat! Keep an eye out for sign-up bonuses that can help you nab your first free hotel stay more quickly. Visit Marriott Rewards Credit Card for more info. Are you a standard millennial like me, or do you deviate from the norm? At 32, I’m not sure how I feel about being grouped with Millennials – but based on the survey findings, I do fit right in! I’m a PADI-certified, mountain-climbing, safari-loving international volunteer! I’m not particularly interested in nightlife, but I do travel in search of delicious food. I’m on the cusp, too! And it totally makes a difference. I’ve found that it helps me bridge the gap between boomer/Gen X management and junior staff, that is, when I’m working in an office setting. The Millennial in me could only make that work for so long…. Ha, I hear you. In fact, some of the only times I’ll utter the words “I need a vacation” is… at the end of a long trip full of adventures, ha. Oh she has her own blog! She’s a bit of a celeb in some sailing circles as she wrote a daily diary on there when she sailed around the British Isles…! She blogs over at http://www.jillbeckett.co.uk, I keep telling her she has a niche and needs to exploit it…! I agree with that. I think that my parents’ generation (baby boomers) are much more interested in relaxing beach vacations. But I want to do all the things while I’m on vacation! You’re right, I want to have an adventure! Hm, it makes me wonder if all inclusive resorts and cruises will wane in popularity as time goes on. It will be interesting to see! Haha yup, as soon as I’ve lined up a new destination, I start looking for ‘extreme’ sports or cultural activities to do there! I’m really not a partier though, so in my case the nightlife aspect doesn’t apply. Haha. I think I have the general idea of it now, though I probably put plastic in there sometimes that isn’t meant to go. Oh well, at least plastic won’t blow up the microwave. Bit of a sales pitch for this Marriot Card – which is probably one of the least desirable Chase products. Many many other better credit card alternatives. Otherwise a great blog! Hey Clementine, as stated at the beginning of the piece, this post is sponsored by the Marriott Card, so no secret there 🙂 But thank you for the kudos otherwise! I am definitely more of a normal millennial, and I completely agree about the vacation thing. I’ve been on plenty of trips in the past few years, but I can’t remember the last time I had an actual vacation. I find it hard to settle down and not want to explore when I’m somewhere I’ve never been before. So probably the only times I can really vacation is when I’m in a place I’ve been a million times before, like Myrtle Beach for example! I am smack dab in the middle of the millennial grouping, at age 25. I agree with most of this. My nerd culture provokes me to visit places I have seen in video games and films, while my adventurous side beckons me to wander deeper and discover. My motherly side keeps me too busy to worry much about the night-life while I am away from home, but my rebellious side keeps me in-tune with the urban culture and spirit of the youth. I feel one day soon, I may even find a balance, but for now, what the heck. This is me. Sounds like you’re getting the best of both worlds 🙂 Enjoy your travels, Haley!